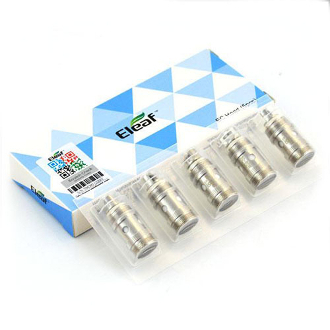 The Eleaf EC Coils are known for their quality performance and their ability to keep producing fresh crisp flavor. They are manufactured with stainless steel casing which makes them durable and long lasting. They have large wicking holes and are produced with 100% Japanese organic cotton for a well saturated and clean taste free of impurities. One of the Eleaf EC Coils best features is there vertical dual coil design. With this positioning of the wiring, the coils give a top notch vape along with their amazing flavor. Another is their simple method of replacement. To change your coil simply unscrew it from the base, grab a new one and screw it right on. Simple as 1,2,3. If you are a user of multiple tanks, fear not! As the Eleaf EC Coils are known to fit in a wide variety of clearomizers. Compatible With: Aspire Atlantis, Aspire Atlantis 2, Aspire Atlantis Mega, Aspire Triton, Aspire Triton 2, Eleaf Melo, Eleaf Melo 2, Vaporesso Target Pro Tank and finally the Eleaf iJust Tanks!